In May 1986, Sang min Park, at the age of 18, was selected as the youngest member of the Philadelphia Orchestra’s cello section. His extraordinary talent compelled his family to emigrate to United States in 1979 where he continued his further musical training at the Juilliard School and performed as soloist for the Elgar and the Boccherini Concertos with the Juilliard Pre-College Orchestra. He was also Selected as the “Presidential Scholar in music” and awarded with the “Presidential Award” at the White House in 1985. In the same year, he was invited to perform with the KBS Orchestra under maestro Myung Hun Chung in Seoul, Korea Since than, He has been invited to perform at the Lincoln and Kennedy Centers. He has performed numerous chamber music concerts with such artist as Charles Niedich, Pamela Frank, Richard Woodham and Sarah Chang. He has received the B.M degree from the Juilliard School and the M.M from Mannes College of Music. 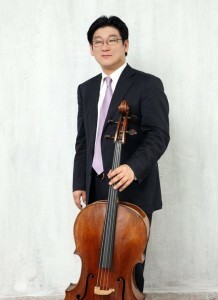 He is currently the associate Professor at the Korean National University of the Arts.